Sound = Vibrations! 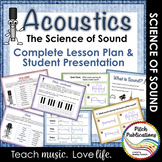 Use this powerpoint to help your students understand what sound really is: energy from vibrations! 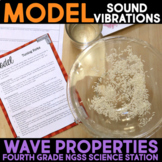 In this science station, students read about sound and model vibrations in sounds in different ways. 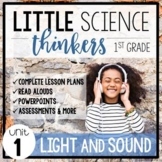 Students then answer questions about the modeling within their science journals or on the included worksheets. This station is also available in a larger bundle of 8 stations at a discount of 35%. 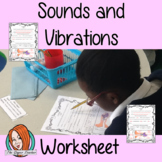 Students explore the visual evidence of sound by actually seeing and either drawing or videoing the vibrations of sounds being created by themselves. Cool, eh! 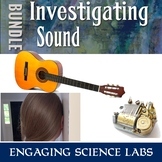 Scientists Investigate: Sounds and Vibrations! Aligned with Next Generation Science Standard- 1-PS4-1. 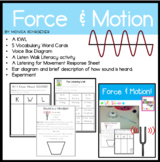 Students will conduct several activities to understand and examine how sounds are created from vibrations. Everyone is familiar with the sound experiment in which you put plastic wrap on a bowl, put rice on top, and then make noises to "see" sound (aka see the rice move from sound vibrations). 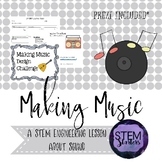 This is a worksheet I made to accompany this activity! 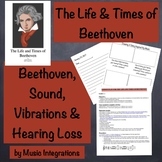 Evaluate student learning about sound and vibrations using this twelve question assessment. Questions are divided into three categories: vocabulary, content specific, and open response. An answer key is included. 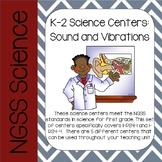 Students will work in small groups investigate sound and vibrations.